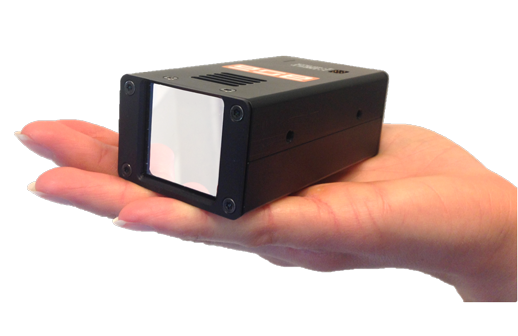 The LynX detector series are hybrid pixel area detectors based on the Timepix/Medipix3/Timepix3 technology. 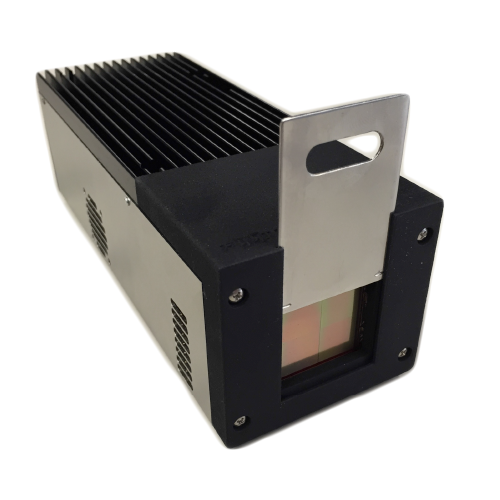 They have a pixel pitch of 55 µm, suitable for a wide range of applications. 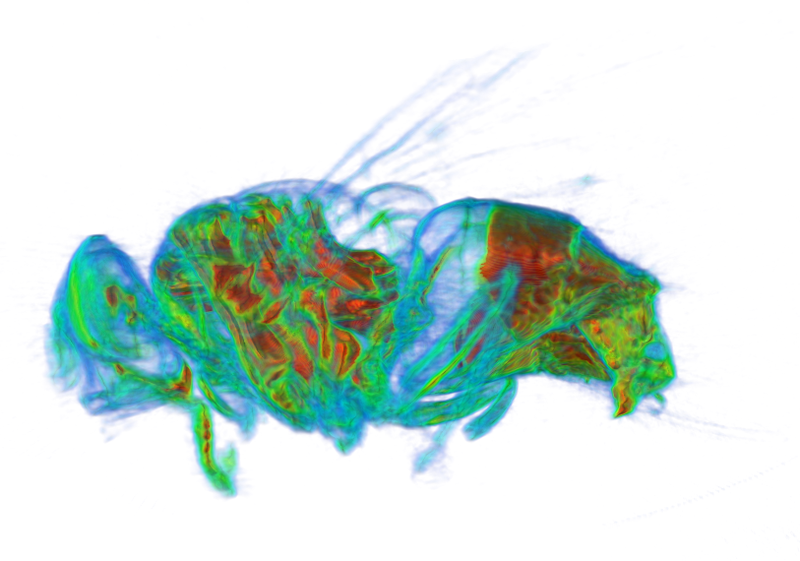 The capability of the LynX detectors to discriminate or measure energy of X-rays in each of its 512 x 512 pixels offers excellent performance for X-ray detection, imaging and tomography. The detectors consist of a sensor (Si, GaAs, CdTe), which is divided into an array of pixels. Each pixel is connected with miniature bump-bonds to the readout ASICs below the sensor. Go to our applications and/or publications page to find out more. LynX 120 is based on the Timepix ASIC. Each pixel either counts the number of detected events, measures the amount of energy deposited in the pixel or measures the time of arrival of the detected photon. The readout provides frame rates up to 120 frames/s. LynX 1800 is based on the Medipix3RX ASIC and has improved speed. In continuous read out mode up to 1800 frames/s with zero dead time can be recorded. In charge summing mode improved spectroscopic performance is achieved, avoiding loss of energy because of pixel to pixel charge sharing. 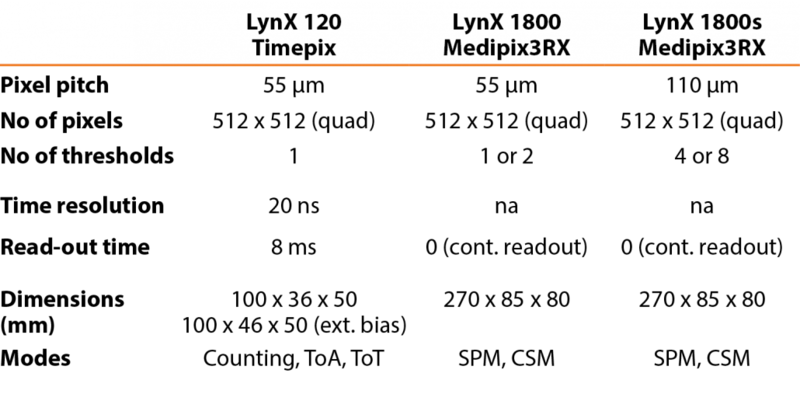 In addition, the LynX 1800s, which is also based on Medipix3RX, but with bumps every 110 µm is also available. In charge summing mode, it has 4 energy thresholds allowing to count X-rays in different energy windows in a single measurement.